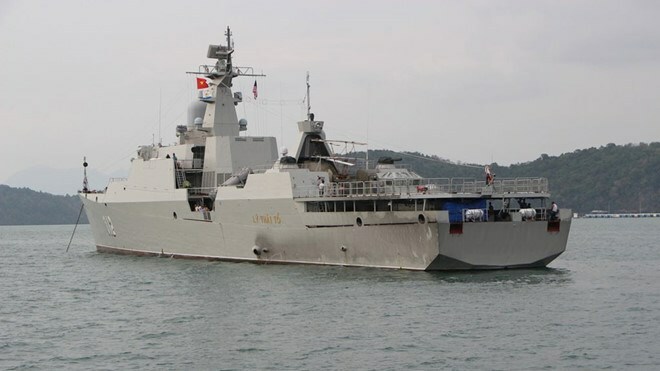 Hanoi (VNA) - Naval ship HQ 012-Ly Thai To of Brigade 162 of the Naval Region 4 joined a fleet review on March 27 within the framework of the 2019 Langkawi International Maritime and Aerospace Exhibition (LIMA 2019) in Langkawi, Malaysia. The fleet review saw the participation of 27 ships of marine forces of Malaysia and 15 others from ASEAN member nations and other countries. It was directly presided over by Malaysian Prime Minister Mahathir Mohamad aboard the host country’s command ship coded 151. Apart from taking part in the parade of fleet, crew members of naval ship HQ 012-Ly Thai To joined a drill at port with naval forces of other participating countries. Participants discussed a drill plan at sea and agreed on operation, communications and commanding plans among tactical groups. The event offered a good chance for Vietnamese naval officers and soldiers to enhance exchange and learn experience, and improve coordination capacity with their counterparts in other countries. LIMA 2019 kicked off on March 26. The five-day event attracted 40 naval ships from ASEAN member nations and other countries, including a submarine of Malaysia. The LIMA is the largest show of its kind within the Asia Pacific region. Held biennially since its debut in 1991, LIMA introduces applications and technologies in military and civil affairs and trade within the maritime and aerospace industries. The 14th edition of the event in 2017 lured 555 exhibitors of 36 countries and territories, including Russia, France, Australia, the UK and the US.